Help! My Puppy is not Eating. Whether it's a puppy not eating or an adult who decides to stop eating, owners can get very distressed especially if it is a four pound small dog. After all they don't have the reserves that a 150 pound Mastiff does if he decides to take a day off from eating. Believe it or not, this is one the most frequently asked questions of people who visit this site. Most of the time it is a puppy not eating, but many people who foster or adopt adult dogs have similar problems. A while back I had a long conversation with an owner who had tried everything to no avail, so I promised her that I would look into the problem and write an article. Voilà. We assume that the reason a puppy does not eat is the same as when adults or seniors take a break from meal time. That is not always the case. Often puppies have unique reasons why they won't eat. 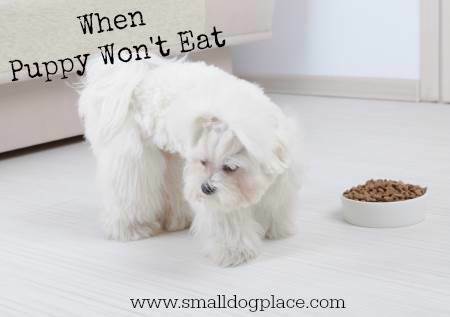 When Your Puppy Refuses To Eat, there are things you can do. Here we are talking about adults past the puppy or adolescent stages that may have been good eaters in the past or are new residents without a clear history of their eating habits. Many reasons are the same as puppies, but you will also see a difference in the reasons below. I will cover the causes and solutions of adults not eating in another article. Let's look at each cause individually and some possible solutions. Many small breed puppies go to their new homes between the ages of 8 and 12 weeks. Prior to coming home to you, they have been with their litter mates, usually their canine mom, and perhaps a variety of other dogs that also live with the breeder. Your home is exciting-a new place to explore and investigate. It offers new sounds, new people, maybe even new animals that are not familiar. Puppies are just as busy as human toddlers, and may forget to eat. There is just too much to do. Why stop to eat when there are children to play with, new smells to investigate and new places to explore. Most good breeders will send a bag of food home with you that you should use immediately. You can choose to continue with this same food or transition to the food you plan to feed. Many breeders will recommend high quality foods, but if not, you will still need to wean the puppy off what they are currently eating and onto your dog food choice. 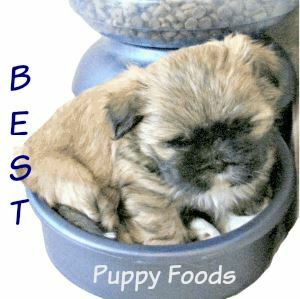 Do not skip this step of changing foods gradually no matter how anxious you are to get your puppy off to a good start. A sudden abrupt change in food is likely to cause the puppy a little upset -- nausea or diarrhea. Either can be a cause of puppy not eating. Sometimes the puppy loves the old food but won't eat the new food. You may need to go back and gradually wean him off the old and onto the new again, even if it means purchasing a bag of the original food that he is used to eating. Small dog puppies are normally so small that owners do not realize that they don't need a large quantity of food to keep them going. If you are a good puppy owner, chances are you are starting your puppy off right from the start with basic training. A small amount of highly palatable training treats can spoil his appetite. Think: Children and Ice Cream. Most parents won't give their kids ice cream and then expect them to eat their dinner 10 minutes later. When choosing treats for training purposes find the highest quality you can afford and then break them into the smallest pieces you can manage. Puppies, like babies explore their environment with their mouths. Everything gets sampled and eaten if the puppy finds it to be tasty. Grass, leaves, dirt, even his own poop, you name it, will end up in a puppy's mouth unless he is supervised carefully. 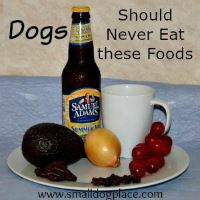 Even a small amount of these items can fill a puppy up and prevent him from wanting good nutritious food at dinnertime. Need I say, supervision will be important here. Internal parasites are a problem for puppies and if not treated, can cause vomiting and diarrhea. Puppies with upset stomachs are not likely to feel hungry. Even external parasites such as fleas, if present in large numbers can debilitate a puppy very quickly. All puppies should be checked for worms, even if the breeder assures the new owner that she/he has wormed them. Worming medicines often have the affect of suppression the appetite, don't expect your puppy to eat well on the day you give him worming meds. The same is true for vaccines. 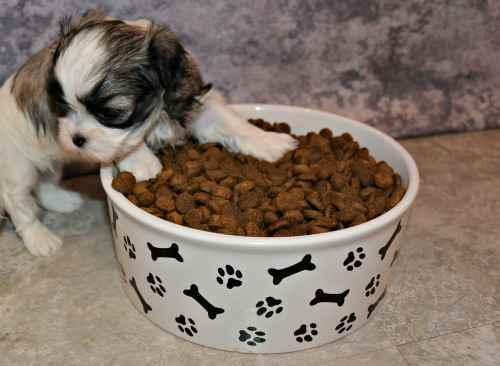 Most puppies will not have a voracious appetite on the day they get their shots. We touched on this above, but anything that is out of the ordinary for a new puppy can cause stress. There is also a short "fear" stage that most puppies go through around 8 weeks of age. Normally this is also the time when they go to their new homes. A long car ride, a plane flight, or just a ride around the block can be stressful to a new puppy who has never experienced these events. A puppy not eating may be responding to motion sickness. Children, other pets, new sights, sounds, smells and tastes in the new home also add to this stress. Stress, even if it is "good" stress is still stress. The poor puppy doesn't know what to do. In between all the chaos, he is expected to eat his food. Who would blame him if he chose not to eat. No one wants a puppy to get hurt, but they sometimes can't help themselves. They run too fast and plow into a door, they try to jump down the step and end up falling, they accidentally get stepped on or dropped. Most puppies will respond to these incidents by stopping, maybe crying for a moment, then giving a good shake and moving on. After all, most puppies survive puppy-hood. Meal time comes along and they aren't feeling well, but no one remembers the accident that happened two hours early. This can be a real issue for a puppy not eating and many people forget that puppies are often cutting teeth, even from the day they go home. Puppies don't cry, whine or become fussy as human infants do during those times of teething, so we often forget that teething pain can be just as real to puppies as it is to our own children. When you have a sore mouth, it is hard to feel much like eating. I have added to category to cover anything else that can cause a puppy not to eat. There is a possibility that there could be a medical problem (although unlikely that is causing the problem). It might also be due to the dog food itself. If the food is bad, the puppy may not eat it. 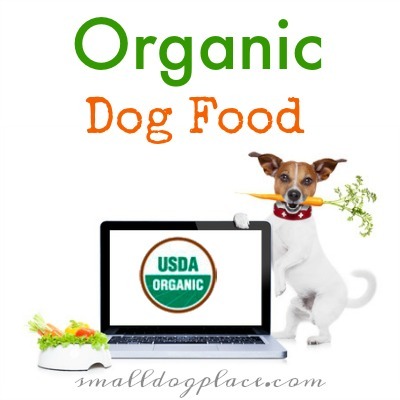 Food that is outdated or even under a recall could be the reason the puppy is not eating. Add a tablespoon of baby food to make the food more palatable. Add a teaspoon of yogurt or cottage cheese to the food. Add hot water to the kibble, allow it to soften and then cool. Serve this soft food to the puppy. Give teething toys to chew on in between meals. (Nyabones are good. Hard biscuits are helpful but go slow with these as they do add calories. Reduce stress during meal times. Feed during quiet times or choose a different location to the feed the puppy. Try a different type of bowl or plate. Serve the food in different types of containers made out of different materials. Sometimes the shape of the bowl is an issue. Try a flatter plate or deeper bowl. Supervise carefully and do not allow the puppy to eat anything other than his food. Teach children to be respectful and careful with the new puppy. Feed the puppy at a time when children are not likely to interfere. 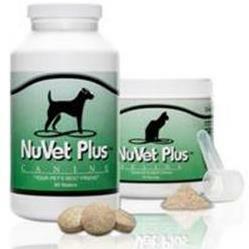 Turn the puppy's kibble into training treats by using them dry or in a softened state. 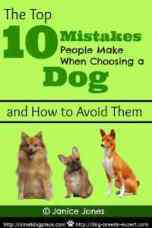 If you found this page about a Puppy Not Eating useful, may we suggest you check out some of the other resources on this website.